The energy cooperative that powers Dillingham and four other Bristol Bay communities is exploring a hydroelectric project that it says could replace diesel generators in the region. 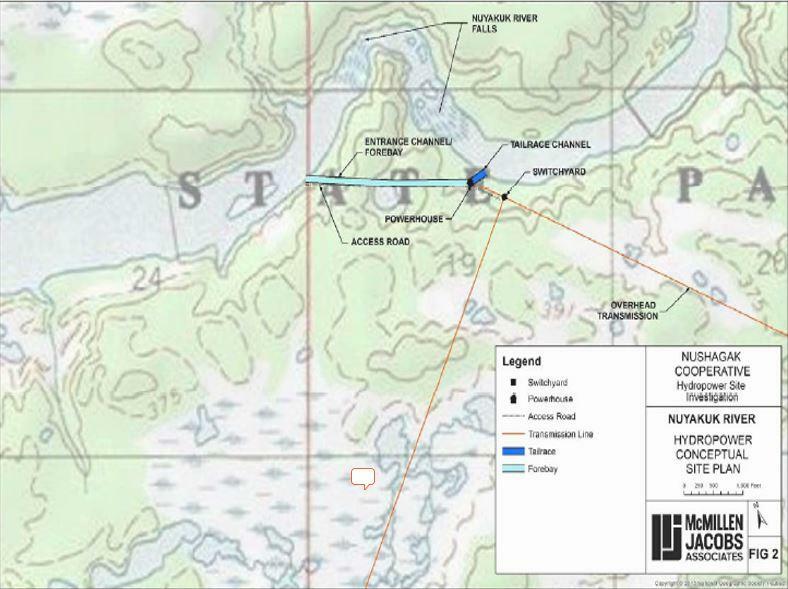 Nushagak Cooperative is exploring the possibility of installing a hydroelectric generator on the Nuyakuk River, a Nushagak River tributary in the Wood-Tikchick State Park. The power co-op currently supplies electricity, cable, telephone and internet to Dillingham, Aleknagik, Manokotak, Clark’s Point, Portage Creek and Ekuk. Based on flow data at Nuyakuk Falls, which the United States Geological Survey has monitored since 1953, the co-op said that it is likely a hydroelectric generator could replace diesel altogether. By diverting a quarter of the river’s flow just above the falls for the generator and returning the water to the Nuyakuk River at the bottom of the falls, a run-of-the-river generator could produce 72,800 megawatts annually. Cooperative members currently utilize 25,000 megawatts a year. “This would make the Nushagak drainage completely independent for its electricity needs. We would no longer be dependent on the price of fuel for our standard of living,” said Bob Armstrong, Nushagak Cooperative electric operations manager. In addition to replacing the 1.5 million gallons of fuel oil it currently takes to produce electricity for co-op members, the energy producer wants to sell electricity to villages up the Nushagak River—Ekwok, New Stuyahok and Koliganek. In Bristol Bay, the push for alternative energy is about cost. The average cost for residential electricity in the United States this January was about 12 centers per kilowatt-hour. For homes that get their power from Nushagak Cooperative, it is about 17 cents per kW. That is after taking into account that State of Alaska pays part of residents’ electric bills in rural areas through Power Cost Equalization. The rate is more expensive for homes that use over 500 kW monthly and for businesses—between 38 and 43 cents per kW. Bob Armstrong presents the project to Nushagak Cooperative members at the 2018 annual membership meeting in March. By switching to renewable energy, the co-op hopes to significantly reduce the cost of electricity in the region. It is refraining for estimating how much that savings would be until more research establishes the project’s feasibility and environmental safety. The project is still in early stages. At the end of March, Nushagak Cooperative, submitted an application for a preliminary permit to the Federal Energy Regulatory Commission. It would be the first of many permits and permissions the co-op must acquire as it initiates studies for feasibility and possible impact, including fisheries studies, water quality studies and wildlife studies. Another barrier to entry for the hydroelectric project is the Wood-Tikchick State Park statutes. Currently, project construction and many of the necessary studies are not allowed at Noyakuk Falls. The Wood-Tikchick Management Council met in Dillingham at the end of March to discuss the project for the first time. The council offered tentative initial support, voting unanimously to support studies under consideration that are consistent with park purposes. The cooperative estimates that the project would cost $120 million to construct and that it would save over $147 million over 40 years. If the project proves feasible, Nushagak Cooperative hopes to have the hydroelectric generator installed in six years. Nushagak Cooperative operates diesel generators to supply power to its five Bristol Bay communities.